Staying alive means staying close: but every time he touches me, I melt inside. I can't resist this man, not when he looks at me as if he wants to push me up against the nearest tree and tear my clothes off.... Is it possible that he's innocent? Can I help him overcome the demons of his past? I'm a city girl but to survive this I'm going to need to learn to live as wild as him...because the greatest danger we face isn't from nature. The other prisoner from our flight is out there with his gang...and they're hunting us. I read this book for the first time back in January of 2017. 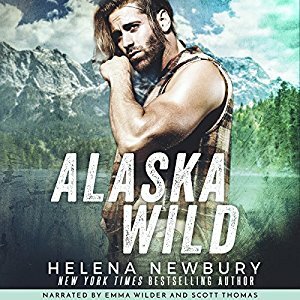 I am open to trying out new narrators so when this one was available on Audible I decided to check it out. on. Desperate to get to Nome when she finds out her witness has relocated there, Kate pretty much forces her way onto a charter flight that two US Marshals are using to transport two prisoners, Martin Weiss and Mason Boone. Kate soon realizes loyalties will be tested and she will have to question what is really right and wrong. I really loved Kate. She was a such a strong character. From her first sight of Boone she feels something but her training is telling her to be wary of him. She has faith in the legal system and if he is wanted by the military, she believes he must have done something wrong. Kate soon learns that everything isn't so black and white. Kate was small but she packed a mean punch and didn't let her size interfere with what she needed to do to survive. She was very much a city girl but she was determined and she really used her wits to get out of bad situations. Kate was the hero in a lot of this book. Boone was an isolated man by choice. Wanted by the military for some transgressions overseas, he couldn't stand to go to jail. He is dealing with some deep demons that only the Alaskan wild can heal. I really love how Boone was shown as strong but vulnerable. I mean he was described as this hulking piece of man but also had this softness to him. Kate is the first woman hes really had deep contact with in years. From the beginning she was the one thing that calmed him. He was in awe of her caring nature but also saw the strength in her. I love how the author choose to portray Boone. He was troubled but worked to overcome his demons. I think she took a chance to show the hero in a way that wasn't the super alpha male. With all that he has been thorough, you understand the choices he has made. He had faith in the system just like Kate, but he realized the hard way that the good guy doesn't always win. I really loved Boone and Kate together. The duo was a tenuous one in the beginning because Kate had trust issues based on some things she learned about Boone but soon a partnership formed. One definetly built on attraction and the will to survive. Kate and Boone has some really steamy scenes but also some ones that really showed how the trust between the two of them was developed. This book had a really good balance of the romance and suspense aspects. This was my second book narrated by Emma Wilder who narrated Kate's POV and I felt she did a really good job as Kate. I did feel her narration was a little slow especially compared to the other book I listened to her narrate but I never speed up audiobooks so I just dealt with it. I think she did a good job with Boone and the other minors characters voices. This book actually had 3 POVs. The other two which were narrated by Scott Thomas were Boone's POV and Wiess. This was my first audiobook from Scott. I also think he did really good with his characters voices. Boone and Weiss were very distinguishable from each other. In some of Boone's really tense scenes, Scott really conveyed the desperation and fear of Boone's character. I really enjoyed the narration of Weiss. He sounded like how a soulless criminal would sound. He also did a good job with the other characters. Both narrators had a few minor characters with Russian accents and while they were not great accents, I was still satisfied with them as a listener. I would pretty much rate the book and the audiobook the same. I think you could get enjoyment out of reading or listening to this story, but I honestly think listening to the audiobook gives the story a little more edge than over reading it. I dont re-read or re-listen to much but I can see this being an audiobook I may come back to.